The build up to Amsterdam followed on from my summer of Ironman training and recovery. It was great to have an aim for the autumn and alongside Vitruvian middle distance, I enjoyed having a focus for training. Following a tough race at Vitruvian, my training then all appeared to be going well. The long runs I did gave me confidence and all was looking good for Amsterdam! I was really excited about running my second marathon since heart surgery and seeing what I had left in my legs after a busy year! Our weekend in Amsterdam was pretty epic, meeting great people and seeing the sights! We made sure got enough rest, sleep and carbs though. Got a few strange looks ordering pasta AND chips Compared to a triathlon, it was a whole lot less stressful with organisation! I was running with one of my best friends and it was brilliant to share the race day experience with her. We got to the Olympic stadium on time, got our positions in the start pen and shivered in the drizzle before the start. This definitely put me off from ever running New York! Once the gun went off, I started off comfortably sitting at 9 minute miles, which was my intended marathon pace. I felt good and confident I could see this through. My head was in it! The miles soon ticked off and all was going well. Once I got to around 12 miles, we ran along an out and back section along the canal where I could see the half way point. The wind picked up and I tried to tuck in behind other runners to shelter. I believed that I was on track to go though 21k in around 1:58. That’s when it all went a little bit wrong! My legs just couldn’t keep up the pace and I slipped down to 9:05, 9:10 then 9:15 minute miles. I decided to have a gel early in a bid to get some energy and did what I could to perk myself up. I was still determined to chase my goal time, so stuck it out for another couple of miles. I went through halfway in 2:01 and was a bit disappointed but having run a couple of negative splits for long runs in my training, I thought it was still possible to push on. After umming and ahhing before the marathon about taking music to listen to, I was really glad I had it for the next few miles. That horrible feeling when you are fighting the strong urge to stop, walk or even give up might just have been too much without my trance-y beats! 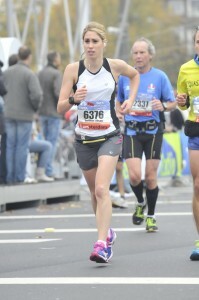 The middle part of the race is a bit of a blur but as all my marathon photos show, there was a whole lot of pain! In all my races post surgery, there has been a time when I needed to use imagery to get me through a tough section. I usually imagine being in the doctors office being told I couldn’t exercise, or wouldn’t have made 40 or being in hospital post surgery being very frustrated – all dramatic images! None of this worked this time, I was just too far past being able to think clearly! As I approached the 30k marker, I had a bit of a scary moment where I went really dizzy after stopping briefly to get a drink from the water station. I ran through this and it went off but it was at that point that I subconsciously gave up on 9 minute miles. To be honest, 10:30 felt like an 8:30 pace to me, I was out of breath, exhausted and just wanted it over! I’ve never been so pleased to see the finishline! I saw the 4:15 pacer just ahead of me so gave it one last push to finish in that time. Not a pb for me, which was initially disappointing but on reflection, I gave it all I had on the day. A marathon is never going to be easy so I’m pleased to have another under my belt! No reason for things to end like they did on the day! The only reason is a whole lot of physical tiredness, which only decides to rear it’s ugly head in a race! The main reason for this blog is recording my journey from having heart surgery last year all the way though to completing an Ironman race so here is my latest update! 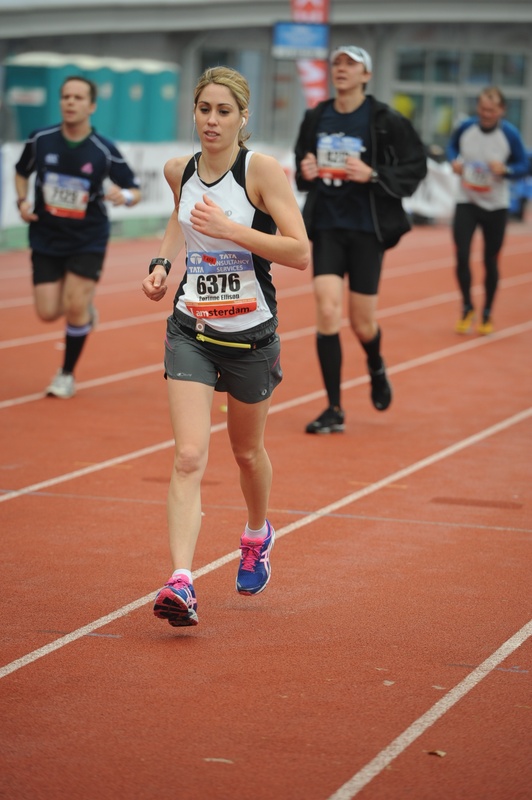 After completing the London marathon in April, my training took on a triathlon flavour! My first race of the season was the New Forest triathlon – an (nearly) olympic distance race. This was my third triathlon, with the last race being nearly 2 years ago. Previous to this race, I’d had limited time on the bike, only a few sessions in the pool but plenty of time on my feet! For that reason, I took it steadily in the lake swim and exited the water feeling fresh. On the bike, I loved cycling through the beautiful New Forest. The scenery was stunning and although the wind was up, it was a steady ride. Onto the run, I felt a little challenged by some of the ‘undulating’ course, but finished the second half of the 10k on a high and even managed a sprint finish! A year ago, completed a triathlon seemed a long way away. Getting back to a previous level of fitness was a goal to keep me motivated. Now I feel I have achieved that and am headed towards new levels of fitness! With a new and improved heart, breathing feels easier, post exercise tiredness is now what I’d call ‘normal’ and the hideous blue / purpleness has gone! All was going well with training, despite work being so busy. If racing meant only having two hours sleep, then I did it! Missing a session was not an option, even if I was excessively tired. Keep going, keep pushing, I kept repeating to myself. If you are going to attempt an Ironman, you have to get used to tiredness, pain and pyschological challenges. What I forgot to do amongst all this was take time off. This resulted in a small burn-out, loss of rational thinking, being unable to get up in the mornings. Small decisions became high mountains to climb. A holiday (was well as regular days off) was needed. So we did, and headed off to Dubai for 10 days. On our return, work was even worse and sheer determination has kept me ticking over with training. I now have an amazing coach, who is really helping with my training , opening my mind to pushing myself further and taking the headache out of planning sessions. I am so excited about the future and planning my Ironman. There is so much choice with races and as you have to apply a year in advance, the clock is ticking! Favourites are the moment are Austria, Florida or the new IM NYC! Decision to be announced soon! Since my last post after the Brighton half marathon, my world has been a whirlwind of excitement! Running, coaching, business, travelling the country and seeing family. I set myself a target last month of spending an hour a day on self development. What a revelation that has been! In the midst of work related tasks (which for me includes my business role, coaching clients, and running (a must do before the marathon), I aimed to spend 60 minutes a day reading, writing, listening or studying. In this time, I have covered and revisited 2 amazing books – Stephen Covey’s ’7 habits of highly effective people’ and Brian Tracy ‘Eat that frog’. The importance of listening to others. Through my coaching, I am developing listening skills, picking up on verbal and non verbal language. Covey suggests you must ‘seek first to understand and then be understood’. Last week, I spend a week with my family which meant staying in 3 different parts of the UK, 2 family meals and lots of travelling! I used this time to really listen to each family members conversations and let them open up. An enjoyable experience! I have also learnt (or remembered) the difficulty and subsequent rewards of marathon training. For the last 3 weeks, I have been running 5 times a week and have increased my long runs (15, 17 and 19.5 miles). This week is my biggest mileage week. Through determination to achieve my target time, I have continued to progress and noticed a real improvement in my running. As I feel this will be my final marathon (apart from the one at the end of Ironman! 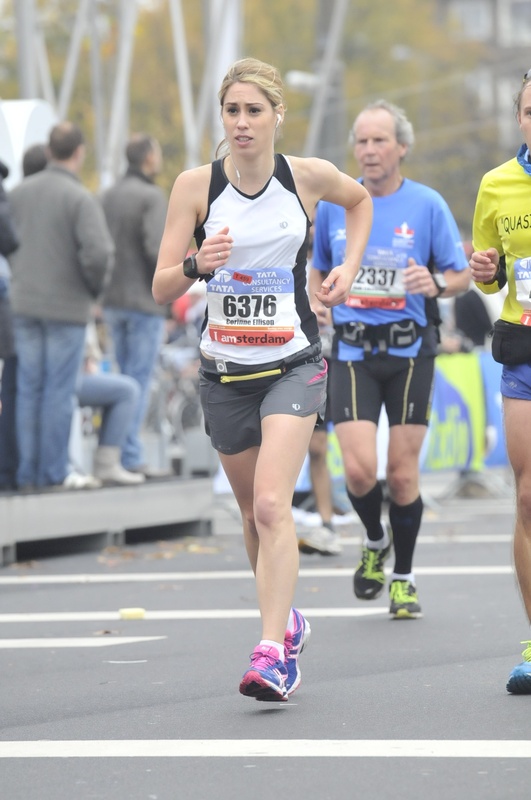 ), I wanted to take stock of what I have learnt training for 4 marathons. Pushing boundaries. With each hill, sprint or group interval session, I felt stronger and more in control. The speeds I can now achieve were completely unthinkable several months ago. Discipline. Training in the UK, over winter is not an easy task. Fitting in 5 runs a week around a 70-80 hour working week is also challenging but I have enjoyed the experience. Early morning runs, late night runs, snow, wind and rain all make for a disciplined athlete. Commitment. Similar to the above but more specifically about sticking to the task. When the going gets tough, injuries or extreme tiredness occurs, commitment is required to keep you going. Accepting and seeing through a challenge. Commitment is the first step, the second step is action. Seeing through your actions is vital to ensure you succeed. With my coaching clients and myself on past blog posts, I have set monthly targets. My favourite one was aiming for 6 miles in 60 minutes – a specific and quantifiable aim which was satisifying to achieve! Cycle twice a week (one on turbo and another longer ride) building up to 25 miles by 17th April. Gym once a week to work on core, legs and strengthen the glutes! This is all achievable if I continue to push the boundaries, commit, dedicate and ‘eat that frog’ first thing every morning (read the book and you’ll see what I’m talking about!). Supposedly 3 weeks into marathon training, today was my first ‘long run’ of the year. After a slow but successful 7 mile run last Sunday with no gliches, I felt up to the challenge of a 9 miler today. After working until 4am last night, I expected to wake up groggy and not all motivated. But, ping! my eyes were open at 11am and I was raring to get out. Having run round Bournemouth and Poole a LOT in the past, I didn’t bother to plan a specific route but took my Garmin. I also made the effort to strap up the heart rate monitor, despite having problems with it rubbing on my scar in the past. I set off at a steady pace, with the aim of maintaining 10:00 – 10:30 min/miles. As a glanced down at the Garmin, I kept slipping back to 9:30! Pre heart op, this just did not happen. I am almost in disbelief. As I ran down the beach at Bournemouth, I was feeling great. I had my iPod on after several runs without music. My mood took a turn for the worse as I turned onto the seafront and faced a hideous headwind, blowing sand and rain everywhere! It was one of those stretches of a long run that tests you to the limits. For the next 4 miles, I looked down, dug deep and fought the elements whilst trying desperately to maintain my pace. Finally, at the end of the beach, I headed through Poole and back home. Again, the endorphins kicked in and I felt on top of the world. I finished in 91:00, an average of 10:07. So pleased. With many more weeks of marathon training ahead of me, I am determined to keep my commitment and focus directed towards the sub 4 goal. Some might say this is ambitious after having a long stretch off after my operation but I believe if I am careful and sensible, I will reach my goal. As I have been reading about recently, it is mental strength that often leads you through difficult times. In an endurance race, whether triathlon, marathon or anything else, your passion for succeeding will carry you to the finish line. My tactic of focusing on how fortunate I am to be out running when others can’t, is the ultimate kick up the bum when you physically start to tire. Try it! Sometimes, guilt is good! I celebrated my small success with a delicious cinnamon and raisin bagel plus a banana milkshake. Next week I have a photo shoot for a piece about me running the Brighton half marathon – my first race since my heart surgery. I am also getting some shots of my scar as I feel it is important to share my experience with others (male and female) who might be going through something similar. Pictures coming soon! Today is my 6 month anniversary since my heart surgery. Amongst the Christmas preparations, I have taken time to consider what has happened in the last year and what I would like to achieve in the next few months. The challenges of 2011, starting with the London marathon and ending with a half Ironman distance race in September (Vitruvian) give me targets to aim for and the motivation to get out and exercise on ‘off’ days. Heart surgery has taken away a little of my faith in my body as I am afraid to push boundaries to the extent I was before. However, I have so much more determination than I did pre-surgery as I feel I have something to prove to myself – that I can achieve the times and distances I believe I can do. The realisation of what I have physically overcome this year plays on my mind. Striking a balance between commitment to work, financial income and business development as opposed to fitness training will be a challenge, but one I welcome. I am a firm believer in the fact that more you do, the more you are capable of. This month has been the busiest ever with events so my December fitness goals fell behind. I am not beating myself up as I have continued to exercise whenever I could. January brings a time to organise and orchestrate the rest of the year and reflect on what I am grateful for. I have a list on my desk which I look at regularly, and this helps me focus. A few words about my scar, 6 months on. Over the cold winter months, it hasn’t been an issue in terms of people starring. A few times, I have felt a twinge of envy seeing a woman with cleavage out! The support I have had online has been incredible, as well as my friends and family. My scar is my story and of both of these, I am very proud. Merry Christmas everyone and an extremely healthy, active and prosperous 2011! After a long week in hospital, I am finally back home and happy to be feeling better by the day. Heart surgery took more out of me (and my family) than I expected. Pyschologically I took a knocking, by way of loss of confidence in the concept that I would ever get back to the same level of fitness. During my stay, I battled with post-operative pain and nausea which resulted in a 10lb weight loss. Not good when you need energy to recover! I struggled to keep my head focused on the long-term benefits of my surgery and I found it all too easy to concentrate on my latest symptom. Positives included the surgeon and anaesthetist assuring me that I would not only be able to attempt the London marathon in April, but may even knock an hour off my best time! This cheered me up no end. Anything is possible, my family reminded me regularly, anxious for me to stay upbeat. My thoughts drifted back to ‘The Secret’ and ‘what you think about, you bring about.’ Enough with being sick, laid in bed and discharge date being postponed. What I needed as a hospital patient was to be able to visualise being well, painfree and at home in my own environment. Now back at home, my recovery has come on in leap and bounds. Today I completed my first outdoor walk, a whole 7 minutes! I assure myself that little and often will pave the way for my running again, and eventually the start of marathon training. Once my sternum has healed, I will be able to get back on my bike and back in the sea / pool again – something that thrills me. 2010 may have been the year to focus on my health and to take stock. There is no point rushing into planning races, other than next year. Above all, I am grateful for the support of my family, so many of my friends and neighbours. I am also thankful for posts from women on a health forum who have gone through the same procedure. I class this as week one of my recovery and the first week of 10 months of steady training towards 26.2 miles! The London Marathon is an epic, annual event in UK running. This year, 37,000 runners took part and battled through the 26.2 distance in warm temperatures. Amongst them was my friend. At age 63 and with no previous experience, Ann completed the distance in a great time. Despite trying to give me some credit for encouragement and helping during the arduous 6 months of training, a marathon is a personal journey that only you can achieve. Physical pain, mental challenges and emotional obstacles are all part of a long distance race. Marathons can be compared to many elements of life. These include childbirth, moving house, marriage and a metaphor for life in general. Even if you aren’t a runner (or wannabe runner), marathons can teach you a lot about the key characteristics of the successful. Determination, motivation and commitment are essential to keep the body going through several hours of physical exertion. Similarly, these qualities are required for a person to achieve a goal in life. Application of marathon principles to life makes you strong, gives you belief in yourself and makes you hungry for more. Much like running, a taste of success is inspiring and encourages further success. Set yourself a target in life, a goal that feels almost overwhelming. Do you doubt yourself when you imagine yourself working towards this goal? Good. That’s how it is meant to feel. Humans achieve the most when they stretch themselves and are not in a ‘comfort zone’. Your goal doesn’t have to be a marathon (although great if it is! ), but something that you have never achieved so far. My fourth marathon could be my hardest yet. With a deferred entry for next year’s London Marathon, I am hoping to run my best time yet following my planned heart surgery later this summer. Set yourself a marathon mission today. As it says on a banner towards the end of the marathon course, ‘You are only 3 miles from history’! You could be only 3 / 6/ 12 months from history. So often I hear this word from close friends and family. I confess to being guilty of using the word when at my lowest. We all do. What is this word? Can’t. Of all frustrating habits in life, a lack of self-believe is perhaps the most destructive. To believe you cannot achieve, is setting you up to fail. Excuses for the word ‘Can’t’ include: you don’t want to, you are afraid of failing, you rather do something else, something easier, you lack belief in your ability, others have knocked your confidence or pride. The list could go on and on. Make a simple but powerful change today. Ban the word ‘can’t’. I have suggested this with a friend today, during a run. Despite momentous achievement to date with marathon training, my friend still believes she ‘can’t do it’. My speculation suggests she fears failure, lacks self-confidence. My experience of running with my friend and through my own running, tells me she CAN do a marathon. The simplicity of pschologically encouraging your body to achieve is extraordinary. I have made it my mission to ban the word ‘can’t’ from my own life and from those close to me. Through this, I hope to open people’s minds to the power of positive thinking.